Selangor, Malaysia, Jan 29, 2016 - (ACN Newswire) - A biochemical compound developed as a radioactive tracer for cell proliferation shows increasing potential for use in cancer imaging, according to a recent paper published in the Pertanika Journal of Science & Technology. In the paper, an international team reviewed studies conducted over the past 30 years on a particular tracer, called "18F-FLT," and found that it has the potential to improve diagnostic imaging, and thus treatment, of some cancers. One way that tumours are diagnosed is by using a radioisotope-labelled tracer that is injected into the body and taken up by cancer cells. Those areas are then highlighted in positron emission tomography (PET) scans. The biomarker most often used for these scans is a radioactive glucose compound: (18F) fluoro-2-deoxy-D-glucose (18F-FDG). However, this tracer can produce false positives when taken up by normal cells, or false negatives when not enough is taken up to capture the true extent of a cancer. Another, newer biomarker, (18F)-3'-fluoro-3'-deoxythymidine (18F-FLT), shows promise for specifically targeting proliferating cells. 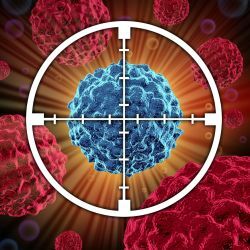 Several studies have found it is less likely to be taken up by inflamed tissue or benign cancer cells, thereby improving the accuracy of cancer diagnostics. "It is well accepted that 18F-FDG is the ubiquitous marker in PET oncological practice. Nevertheless, 18F-FLT is an exciting marker with improved specificity that could be the number one candidate for therapeutic monitoring," wrote the lead author, Hassan Hishar, of the Universiti Putra Malaysia. The 18F-FLT tracer combines a sugar and thymine, one of the four main components of DNA. The compound is incorporated into DNA when a particular gene (TK1) is active, and that gene is much more active in malignant tumours. 18F-FLT has proved better than the more common biomarker, 18F-FDG, in revealing a variety of cancers, including bone marrow, pancreatic and lung cancer. However, it is unclear how well it works for breast and brain cancer, and studies have found it is less effective at detecting colorectal and melanoma cancer. The team recommends further research to better understand the potential of 18F-FLT in cancer imaging. Tel: +603 8947 1641; Mobile: +6012 270 7486.